Get know what is Face Recognition ?? Click here to read.. IN the past few years, face recognition owned significant consideration and appreciated as one of the most promising applications in the field of image analysis. Face detection can consider a substantial part of face recognition operations. According to its strength to focus computational resources on the section of an image holding a face. The method of face detection in pictures is complicated because of variability present across human faces such as pose, expression, position and orientation, skin colour, the presence of glasses or facial hair, differences in camera gain, lighting conditions, and image resolution. Object detection is one of the computer technologies, which connected to the image processing and computer vision and it interacts with detecting instances of an object such as human faces, building, tree, car, etc. The primary aim of face detection algorithms is to determine whether there is any face in an image or not. In recent times, a lot of study work proposed in the field of Face Recognition and Face Detection to make it more advanced and accurate, but it makes a revolution in this field when Viola-Jones comes with its Real-Time Face Detector, which is capable of detecting the faces in real-time with high accuracy. Face Detection is the first and essential step for face recognition, and it is used to detect faces in the images. It is a part of object detection and can use in many areas such as security, bio-metrics, law enforcement, entertainment, personal safety, etc. It is used to detect faces in real time for surveillance and tracking of person or objects. It is widely used in cameras to identify multiple appearances in the frame Ex- Mobile cameras and DSLR’s. Facebook is also using face detection algorithm to detect faces in the images and recognise them. The knowledge-based method depends on the set of rules, and it is based on human knowledge to detect the faces. Ex- A face must have a nose, eyes, and mouth within certain distances and positions with each other. The big problem with these methods is the difficulty in building an appropriate set of rules. There could be many false positive if the rules were too general or too detailed. This approach alone is insufficient and unable to find many faces in multiple images. The feature-based method is to locate faces by extracting structural features of the face. It is first trained as a classifier and then used to differentiate between facial and non-facial regions. The idea is to overcome the limits of our instinctive knowledge of faces. This approach divided into several steps and even photos with many faces they report a success rate of 94%. 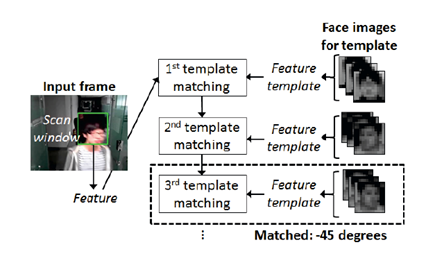 Template Matching method uses pre-defined or parameterised face templates to locate or detect the faces by the correlation between the templates and input images. Ex- a human face can be divided into eyes, face contour, nose, and mouth. Also, a face model can be built by edges just by using edge detection method. This approach is simple to implement, but it is inadequate for face detection. However, deformable templates have been proposed to deal with these problems. The appearance-based method depends on a set of delegate training face images to find out face models. The appearance-based approach is better than other ways of performance. In general appearance-based method rely on techniques from statistical analysis and machine learning to find the relevant characteristics of face images. This method also used in feature extraction for face recognition. Eigenface based algorithm used for Face Recognition, and it is a method for efficiently representing faces using Principal Component Analysis. The algorithms like PCA and Fisher’s Discriminant can be used to define the subspace representing facial patterns. There is a trained classifier, which correctly identifies instances of the target pattern class from the background image patterns. Many detection problems like object detection, face detection, emotion detection, and face recognition, etc. have been faced successfully by Neural Networks. Support Vector Machines are linear classifiers that maximise the margin between the decision hyperplane and the examples in the training set. Osuna et al. first applied this classifier to face detection. 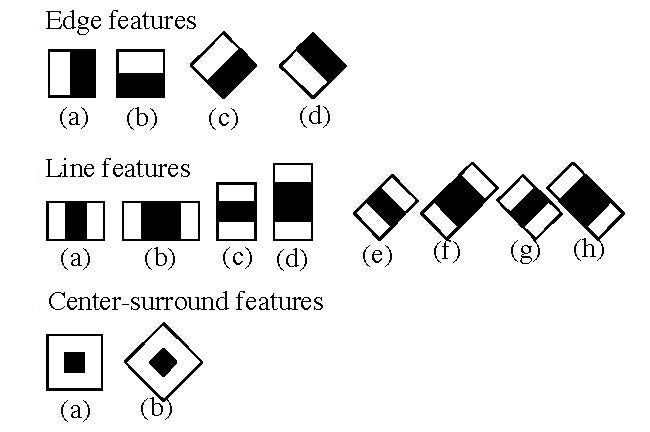 They defined a sparse network of two linear units or target nodes; one represents face patterns and other for the non-face patterns. It is less time consuming and efficient. They computed the probability of a face to be present in the picture by counting the frequency of occurrence of a series of the pattern over the training images. The classifier captured the joint statistics of local appearance and position of the faces. The states of the model would be the facial features, which usually described as strips of pixels. 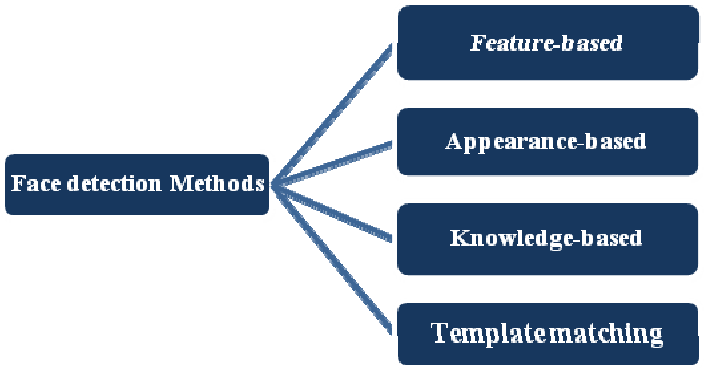 HMM’s commonly used along with other methods to build detection algorithms. Markov Random Fields (MRF) can use for face pattern and correlated features. The Markov process maximises the discrimination between classes using Kullback-Leibler divergence. Therefore this method can be used in Face Detection. This approach has been used to detect faces. Algorithms like Quinlan’s C4.5 or Mitchell’s FIND-S used for this purpose. Firstly the image is imported by providing the location of the image. 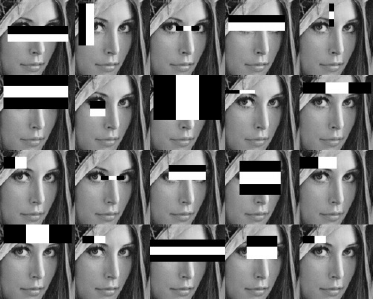 Then the picture is transformed from RGB to Grayscale because it is easy to detect faces in the grayscale. After that, the image manipulation used, in which the resizing, cropping, blurring and sharpening of the images done if needed. The next step is image segmentation, which is used for contour detection or segments the multiple objects in a single image so that the classifier can quickly detect the objects and faces in the picture. The next step is to use Haar-Like features algorithm, which is proposed by Voila and Jones for face detection. This algorithm used for finding the location of the human faces in a frame or image. All human faces shares some universal properties of the human face like the eyes region is darker than its neighbour pixels and nose region is brighter than eye region. The haar-like algorithm is also used for feature selection or feature extraction for an object in an image, with the help of edge detection, line detection, centre detection for detecting eyes, nose, mouth, etc. in the picture. It is used to select the essential features in an image and extract these features for face detection. The next step is to give the coordinates of x, y, w, h which makes a rectangle box in the picture to show the location of the face or we can say that to show the region of interest in the image. After this, it can make a rectangle box in the area of interest where it detects the face. There are also many other detection techniques that are used together for detection such as smile detection, eye detection, blink detection, etc. Previous Samsung Galaxy M20 Review: In the range of ₹13000 will it give tough fight to Xiaomi Redmi Note Pro 6 ? ?